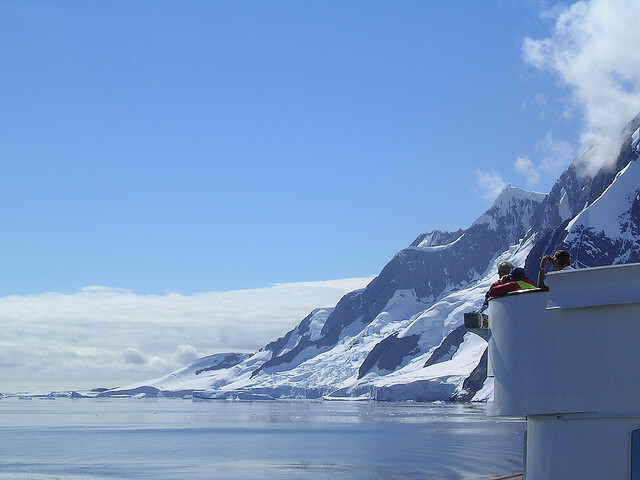 A cruise to the Antarctic Peninsula is one of the most popular cruises to Antarctica. Just a short hop away from the world’s southernmost city, this icy finger of the white continent juts its way northwards towards South America – making it the most accessible part of the continent for intrepid explorers. As a result of this accessibility, it makes it one of the most popular destinations in Antarctica. When we say popular, only 30,000 people per year actually visit Antarctica – so it is hardly a trip to the Eiffel tower in the middle of summer. In fact, it’s the same amount of people who live in the city of Dubbo, Australia or Windsor in the United Kingdom. In a world where 1.1 BILLION people took overseas trips last year (many people multiple) you start to get an idea on how many visitors visit this wilderness. But what makes the Peninsula so special? Firstly, it is the warmest part of the continent.. At 63 degrees south the water is warm enough to sustain a lot of local species whilst they are the most active during the summer months. The large amounts of krill feed the hungriest whales, to sea lions to penguins – and everything in between. This allows for large colonies of these animals being on full display during the warmer months (from November – March). Antarctica is a wildlife destination, much as the Serengeti of Africa, The Galapagos Islands, The Amazon – If you like wildlife you must visit the peninsula, and walk among these magnificent animals and see them for yourself! As the peninsula is the warmest part of the continent, a cruise in Antarctica will allow you to see more icebergs, sea ice and glaciers in a relatively small area due to the unique topography. The peninsula is very mountainous – with some peaks over 2800 metres. This allows for considerable protection from the winds that buffer these latitudes. The sheer drops of the cliffs into the sea also make for some pretty spectacular sites – such as the famous “Kodak alley”: Lemaire Channel. The beauty spots don’t stop there, Neko Harbour is legendary, Paradise bay – Incredible, every turn your ship makes will leave you longing for more. Most cruises and expeditions to the Antarctic Peninsula allow you to spend around 9 – 12 days in the Antarctic. These ship based expedition cruises offer the comforts of home and protection against the elements. The expeditionary nature of these trips allows you to get ashore, cruise around icebergs and sometimes even camp in Antarctica or kayak in the placid calm waters. There are also some trips that head further south and cross the Antarctic Circle. These Polar circle cruise options give you a bit more time (and more bragging rights!) as you cross the mythical line at 66.5628 degrees south. A visit to the Antarctic Peninsula is like no other place on earth, check out some of our other blogs and more importantly, check it out for yourself! If looking for a longer trip consider doing a cruise to the Falkland Islands, South Georgia, The Weddell Sea or East Antarctica.